Absolutely my new favorite side dish. Absolutely! 1. Get a pot of water boiling and add half the package of gnocchi. Cook according to directions (boil for about 3 minutes, until they start to float). Be careful not to over cook of they’ll be too mushy. Remove the cooked gnocchi and repeat with the second batch. 2. While the first batch of gnocchi is boiling: In a frying pan over med-high heat melt the butter until starting to brown. First it will foam, then when the foam goes it’ll start to brown and you’ll see lots of little tiny brown bits form. Yumm. 3. 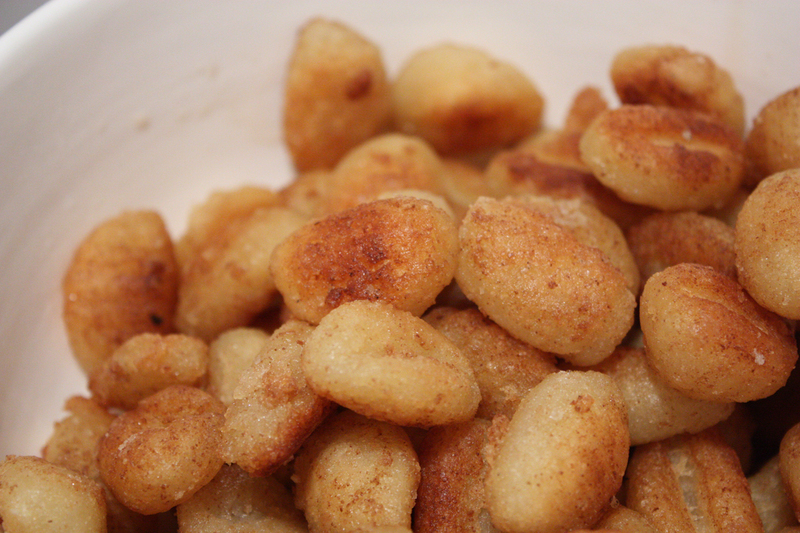 Add the cooked gnocchi to the pan and fry, stirring frequently, until the outside is golden brown and crisp. Sprinkle with the slightly bit of salt. Enjoy! Previous Post: « Dang it. Yay! Glad that you liked them Elsa. Bo and I were the same, we'd never had them before I did it like this. We were popping them like they were potato chips! I hear there's a birthday tomorrow too (the same as Bo's! ), so HAPPY BIRTHDAY!